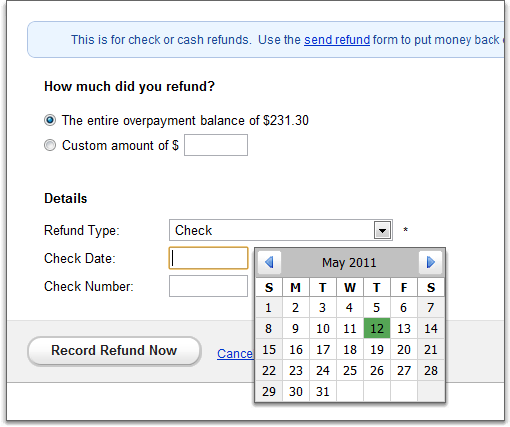 Yesterday, we released an update that added refund functionality to OwnerRez. Before, you had to send refunds offline via check or cash or with your PayPal account. Now, you can send refunds directly through the system. First a quick peek at how it all looks. 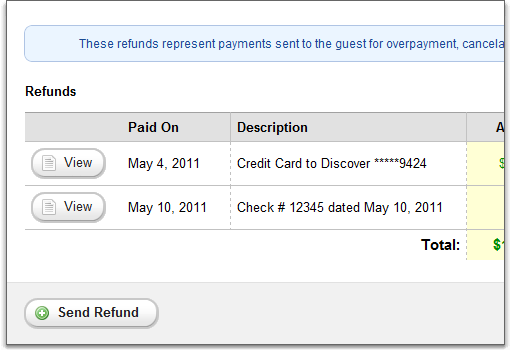 Open a booking and click on the new Refund tab. You'll see a standard box showing the refunds that are associated with the booking. If you've never sent or recorded any refunds, the box will of course be empty. After you've sent or recorded refunds, the box will show the ones for that booking just like you're used to seeing with payments or security deposits. If you click the Send Refund button, you'll probably see a message informing you that you can't send a refund because the booking has no "overpayment balance". I'll explain what this message means in a later post. For now, let's assume that the booking has an overpayment balance and you see the Send Refund page. You only have to enter an amount, select a previous payment that the refund should be linked to and press the Send button. That's all it takes to put money back on the guest's credit card. Emails, similar in format to the payment emails, are sent to both you and the guest. If you've already sent a refund via check, cash or a different credit card process, you can record those too. You'll notice links for "recording manual refunds" in several different areas under the Refund tab. When clicked, you can fill in the relevant fields and bring your booking up to date. 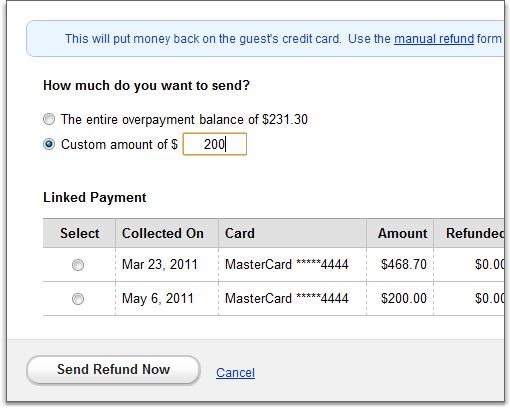 Emails are sent to the guest when manual refunds are recorded too. In the next few posts, I'll be discussing some of the more specific nuts and bolts of the refund process that may be confusing. We've tried to make refunds as easy and straight forward as possible, but there may be some wording that you don't understand. Please send us feedback. Even though sending refunds is a rare occurence for most owners, we wanted to build a quality refund feature to round-out the full booking lifecycle. Those times when you do need it, you'll be glad it's just a few clicks away.